Autographed photo of Louis Armstrong's band at Rancho Don Carlos. Photograph shows (L-R): Barney Bigard, George Reznick, Larry Schwartz, Trummy Young, Johnny Bering, Carl Riller, Kenny John, Arvel Shaw. 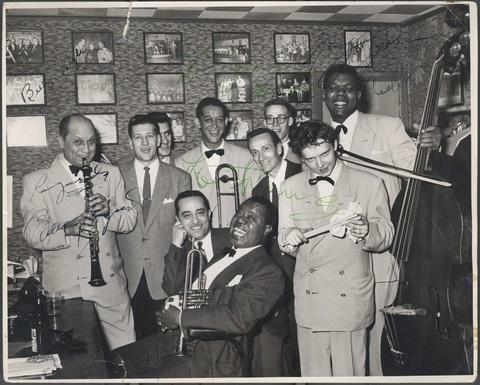 (Seated, L-R): Charlie Mazzone, Louis Armstrong. Date of photograph is uncertain, taken in late 1940s.